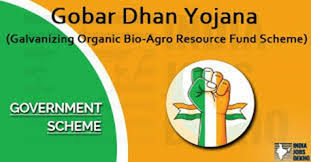 GOBAR-DHAN scheme was launched the Union Minister for Drinking Water and Sanitation, Uma Bharti.GOBAR-DHAN stands for Galvanizing Organic Bio-Agro Resources (GOBAR) – DHAN. The scheme was launched at the National Dairy Research Institute (NDRI) in Karnal, Haryana. This scheme aims to positively contribute to cleanliness and generate energy from solid waste. It has twin objectives- to make villages clean and generate energy from cattle and other waste. This scheme was announced by Finance Minister Arun Jaitley while presenting Union Budget 2018. Under this scheme, bio-gas plants will be set up at individual or community level and also at the level of Self Help Groups and NGOs like Gaushalas. The funds required to setup bio-gas plants will be provided by central and state governments in the ratio of 60:40. A target has been set by the Government to setup nearly 700 bio-gas units in different states under the scheme during 2018-19. The scheme will create new rural livelihood opportunities and enhance income for farmers and other rural people. This scheme will be run by Swachh Bharat Mission (Gramin). Under Swachh Bharat Mission (Gramin), over 3.5 lakh villages, 374 districts and 16 States/UTs across India have already been declared open defecation free (ODF). The GOBAR-DHAN scheme is an important element of this ODF-plus strategy. What does the acronym GOBAR-DHAN stands for? GOBAR-DHAN scheme is launched under which Ministry? Who is the current Minister for Drinking Water and Sanitation? When was Swachh Bharat Mission Launched and by whom?